I rethought blogging, now that I’m nearing my two year mark. Am I a writer who would be better off stopping and being a reader? Then my blog received an award and I was asked a series of questions about how and why I blog. Do I think it’s going to do me or my career any good? Those are good questions. I’m not a traditional blogger, in that I don’t usually write vignettes about my life and family, but I do put myself in my writing, always. We all have our reasons for blogging. Some of us have health issues, and we are isolated inside our houses. Some of us are poets, and we all know how rich poets are…. Not. Some of us are just starting out, and hoping to learn as we go. My reasons for blogging are simple. I love it. I hope kids read my work. I love to hear that kids of any ages like to read fairy tales, classic, retold or completely new. Even more personally, I love when people enjoy my writings. If I didn’t blog, I would be isolated, writing in my own house, struggling to find time to send out manuscripts and hoping to meet other writers somewhere. I want to write as often as I can, to hone my craft and grow, and I love being part of a community of supportive writers. I’ve seen other writers and photographers grow, improving their writing, trying new ventures and being brave. Being brave is key. I thank all of you for your support of friendlyfairytales, and thanks for all the awards!! Thanks to Belsbror for the Award for Love and Kindness, which is new to me. *Blushes* This is what Belsbror said about me: “She is the child in all of us. I could never think of a word that best describes her. How about unique?” Wow. That is an honor, and I am happy to speak to the inner child we all protect inside ourselves. 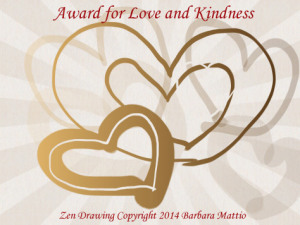 We are meant to share an act of kindness another blogger has done for us as part of our acceptance of this award, and since it’s my first acceptance of it, I will tell you a story. As most of you know, I write stories for kids of all ages, and my fairy tales are published here. I also write other stories, too, and I’m looking for a traditional publisher, heaven help me. I wrote haibun and followed PaulScribbles, who also writes haibun, some about being Scottish and playing African drums. I wrote a story with a character who played a djembe, and Paul very kindly read it for me, to catch any egregious drumming-related errors. I was honored that he was willing to read my story, and his response was very kind. Thanks to Amy Pinkrose for the Wonderful Team Member Readership Award. Amy is spreading love and wisdom over at Petals Unfolding. I hope you have time to visit her! 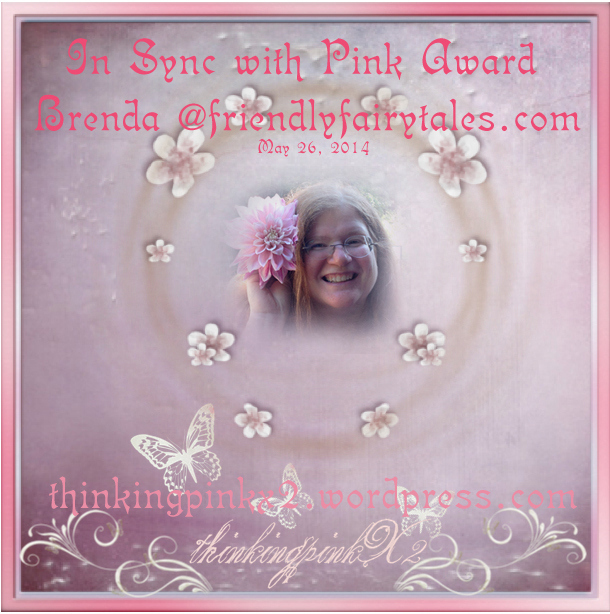 Thanks to Jeanne Marie and MichelleMarie at ThinkingPink, who gave me an award all my own!! I love how pro-Pink they are. I love their PINK site, it’s a new movement to celebrate and promote female well-being and joy in sisterhood! 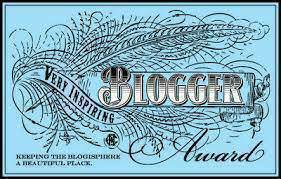 Thanks to Melissa Barker-Simpson for nominating me for the Very Inspiring Blogger Award. Melissa is a terrific poet and an enthusiastic and supportive friend. GlamCurvy T then nominated me for it again. Glam is into fashion for the curvy, and has a lot to offer. Thanks, Glam! Dear Kitty, a caring blogger with a connection to the animals, then nominated me again!! Woo-hoo! 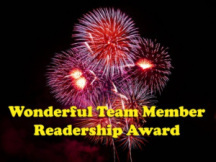 Thanks to Barbara at IdealisticRebel for the Reader Appreciation Award. She is a friend with a big heart and a big range of issues she follows. Even me! 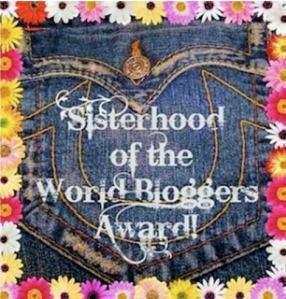 Thanks to Julianne Victoria, my good friend, who gave me first ever blogger award, the Sunshine Award, way back when!! 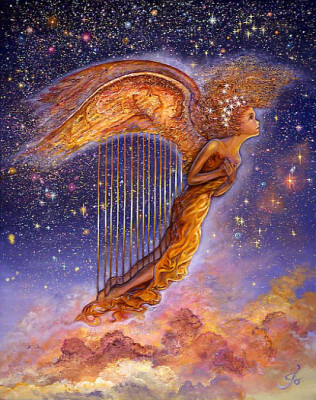 She has given me the Angel Award, and she called me an angel. What a lovely thing to say! Julianne Victoria writes about spirit guides, yoga and published Haiku by Ku. 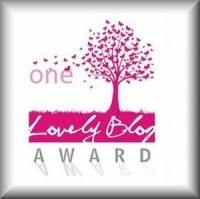 Thanks to Susanne Leist for nominating me for the One Lovely Blog Award. Susanne write the Dead Game, a paranormal and vampire fantasy series with chills and thrills. Thanks also to Lydia and Anastasia at Cupcakes and Popcorn for nominating me again for the One Lovely Blog Award. Thanks also to Laine Jensen at A Poet’s Journey, who nominated me again. She is terrific and insightful poet. If you have not checked out her blog, you should. A new one for me, thanks to Vik at Following the Ink for the Recognition Tag, which startled and gratified me. How lovely to have someone just drop by and appreciate you and your blog. 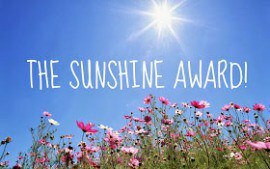 Thanks to Blood, Lace and Faeries for the Sunshine Award. A fun place to shudder at the darker side of magic. This is a party, so how about the refreshments?! How about molten chocolate lava cake, whipped strawberry smoothies, honey and almond baklava, peanut blossoms and New Year strudel. The fairies are dancing a jig, but the ale is spilling on the carpet. I hope you will quaff a sustaining brew, be it green tea, protein smoothie, fairy nectar, merlot or pale ale, and celebrate with me and all of the fabulous bloggers on WordPress and elsewhere. Why blog? Why not? We have voices and we matter! Why do you blog? Here’s your chance to share and care. If you answer the question in the comments, please help yourself to any of the above awards. You earned it! I agree with your many followers. You are an amazing blogger, so fun and funny and spiritual. You take time to make everyone feel important. That is a gift. I blog because I have been blessed with a special life and hope that I can share my blessings with others. Plus, I’ve made some very nice friends, like you, my friend. Have a good weekend. wonderful Brenda – congrats – I am on good hopes you follow my blog as well and being a professional musician with winning awards! I do follow your blog, too. I usually follow back, and you always leave lovely comments, making it easier for me to find and visit you. Thank you Brenda for your kind words and compliments – There was a comprehensive report few months ago at NBC, showing how we professional musicians never receive our presence and share on WP. You have such wonderful and creative page, Congrats! I missed that NBC report. My children study music, and I don’t take it for granted at all. It’s a difficult and beautiful art. Yes, Music has been a vitamin in my life. I am glad your children enjoy and study Music! Bravo!! Thank you for following my blog. I enjoy reading the poetic words of others and look forward to reconnecting with fairy tales. I have found marvelous people out there and they are all over the world. I enjoy art and the pictures are great. It reaffirms in me that there is a huge community of people like myself who enjoin writing and reading just for the action of doing just that. That is why I blog. We could all do with less reading and more time to write, but I found even when I had a break recently I still found thing to read somewhere on the internet – it becomes a way of life, and it’s difficult to completely let that go. Also I think you have expressed it’s a good way to improve on your writing. It’s not much fun writing to yourself. Maybe some writers enjoy keeping their writing secret, but it doesn’t do much for me. I would love to know what JK Rowling said in her book about bloggers! I’ve been reading a lot about publishers and various writers experiences after being published and most of it wasn’t very good. There were several accounts of writers going through months of preparation and changes to their book they didn’t feel were really necessary and then the damn silly publishers changed their mind and left them with no publishing deal! 😦 I’m not convinced now that being published by a publisher is the easy way a lot of writers think it is. Do you know that they pretty much rely on the writer to publicise their own book?! A lot of writers think the publisher will spend money advertising it – but they don’t always, which is often why new books from new authors fail, not to forget to mention the inappropriate covers they stick on books sometimes, a bad cover can kill sales of a book. The amount of publicity you need to spend on a published book is the same as it will take if you are self published, but the bonus is in self publishing – you get paid more per book. A publisher will never pay you for spending time or your own money on promoting your book. I think traditional publishers should be thinking about the damage it’s going to do them long term – a lot are now going out of business, and it’s no surprise, writers are catching on that they can earn more long term if they are clever in promoting their book. My writing has improved over two years of blogging, and I enjoy the community. Writing this helped me think through why I blog and what I get from it (obviously not money). I went to a writer’s conference and told an author I met that I love it. She asked why, and I said people say the nicest things. She looked doubtful, and I told her that one person had told me that he likes my work better than JK Whoever. She said, “Well, at least they have senses of humor.” It was a hurtful exchange, and it dented my pride in my achievements for a span, but I’m shaking it off. What you say about self-publishing makes sense, and I don’t disagree, but I would like to pass the gatekeepers at least once. Maybe I’m old-fashioned. How did your novel progress? Smile on the inside Brenda – she envied you for something she didn’t have!! But it is a very spiteful thing to say, and bit stupid too. She sounds to me like she’s commenting on something she knows nothing about, but doesn’t want to admit that. There’s a lot of jealousy among writers – amateur and professional. I’ve been reading about that recently too, and I just don’t get it at all, I’ve never really felt jealous of anyone for any reason, and I’ve never been a privileged person either, but to get screwed up on the inside about another persons success or enjoyment in life is just such a waste of energy and really quite crazy! Thanks! LOL It’s a bit overwhelming, really. What a great post, and such a creative way to address awards! I’m enjoying looking through your blog. You are such a talented writer. Oh, my. You’ll turn my head. Oliana is lovely. I read a few of the start of your Ashram journey, and it sounds peaceful and moving. Another world from mine, but yet connected somehow to the way I feel hiking in the woods. Oh don’t stop writing,you do it so very well. I know what you mean though; sometimes I feel like taking a break from writing to read more,but writing is so much a part of our lives, how can we ? It can be difficult to read when one is so focused on creating ideas. Aw, thank you! Sometimes I think I should stop, but I can’t imagine that when I come to my senses. I love it! I sometimes feel like that,wanting to retreat back to my notebook. But all the friends we make is priceless. And who knows who you touch with your words. Oh You will do fab. You have a natural talent and it will shine through. Oh, you are lovely, thank you! Yeah! That makes me happy. LOL There you go! I imagine she sees herself as an exception, but perhaps you’re right, perhaps she needs a break. I was amazed by how many people she considered crucial to her having time to write. The acknowledgements are always very revealing. I hope you will accept the One Lovely Blog Award, if you are not morally opposed to awards. I never expected any readership when I put up my fairy tales. I only put them up so that I could stop handing out copies to family. I’d forgotten that. This attention and all these awards were quite unexpected. It’s kind of snowballed. I enjoy it now. Yes, all good points. I struggle with time shortage, too. Sorry to hear that your holiday break included a bout of stomach flu. 😦 I started the holiday break with a terrible cold but, thankfully, it vanished fairly quickly. Glad you haven’t put blogging aside. I love Celia Rhodes response: ” I blog because the world has enough ugly.” After the event in Paris yesterday, I think our blogs, our kindnesses and our friendships are more important than ever. So take that JK Rowling. LOL I’m sure JK Rowling would not want to cast a dark cloud over people seeking their joy where they can. Yes, the event in Paris are a condemnation of us as a species. Is that really the best the human race can aspire to do? Makes me ashamed to be human. what a wonderful blog of gratitude, brenda. you deserve all of the accolades and more and i would know the fairies have an award tucked away for you somewhere, for helping your readers to see the magic within them. it never gets old and keeps us all young, in fact. i blog for the same reasons, because i like to express myself and i like the human factor in all of this, the give and take, the support and unexpected surprises i find here in the blog world each and every day. I blog to document my photography journey. I think that in some cases or subjects, we could use a little more reading, and less writing, but I personally feel that they should balance, and I think that there are way more readers than writers anyway. Just an opinion, nothing factual. And yes, I will take anything chocolate, please! You get the Angel Award, you lucky blogger, you! I agree that balance is a good thing. Photography works well in blogging. I love to look at photos, endlessly, same as each sunset is beautiful and new. To be a good writer, I think lots of joyful reading is essential. Just for you, I have a special dark chocolate truffle with essence of orange and royal bee jelly. You have my heart and I agree, we will remain friends, through ‘thick and thin.’ I hope to be there someday, proud as a peacock, when you get all of your writings compiled and published. You are on your way, Brenda! You inspire and give me courage to try new ways of writing, too. In the sense of blogging, you have been a mentor. I am so happy to share a slice of French silk pie with you. I don’t know if I’ve ever had it before. 😀 Yum! Thanks! I would be happy for you to accept a little sunshine if you accept awards. We all need a little sunshine. I love receiving awards. I already have the sunshine award, but am happy to receive it again. I can’t get enough sunshine in my life. I am behind with posting my nominations and may have to do less than a required amount just to catch up! I am always behind. It’s a permanent state of being. I will toil in my corner of the world, and you enjoy your sunshine. Yeah, I thought that the reviews might cause that to happen. She is so talented, and a masterful writer. But perhaps this book ventured too far into the seamy side of life for me. First, Congratulations to you Brenda for many well deserved awards. I don’t know that I see myself as a blogger, though I have always been a writer and blogging is a new venue for writing which I have come to enjoy in ways I hadn’t anticipated. I began my blog site at Better Endings because an agent asked me to consider blogging in order to build a “platform” that would allow my book manuscript to receive better attention from editors and publishers. But I have discovered IN blogging a whole new universe of exploration and possibility for growth as a writer and as a member of a wider conversation. I love many of the blogs I have discovered, finding bloggers to be deep, honest, “real” thinkers and feelers and many to be excellent writers and creative artists as well. I am happy to have stumbled into this realm of blogging that connects us all to something greater than one perspective or set of values or ideas. Congratulations! Your reasons for blogging are sound ones. I love it, too. The creative process is stimulating. The conversations and community building is what makes me keep writing. Oh, BTW, I love your banner of the snow and pine needles! Oh, thank you! I’m sad the WP snow flurries are done for the year, even if they were a distraction. 🙂 If you accept awards, I hope you’ll take the sisterhood one. It’s a good one for a community builder. Thanks for commenting!! I understand. I try to read whenever I can. I’ve learned a lot from the interactions. Hope your New Year is shaping up well. Best wishes and congratulations for being recognized by so many blogging fans – you are a fabulous writer who is putting her mark on the world in a very engaging and inspiring way. Love your work ~ please don’t stop sharing. Happy New Year Brenda! I blog because I get to meet people like you! I hope you’ll accept the sunshine award, because you make the sun shine! I love that you are writing some poetry! I’m glad you are finding a way to make it all work for you, and I hope your cards and art are very successful. I can’t wait to see how it looks when you’re done transferring. I love the challenge also. All the commenting is fun for me. I also recently started trying the email linkup, so Mondays, BAM! LOL Good luck with all your ventures! I’m honoured Brenda, thank you! One day I will get around to thanking you properly for it with a post, I think I will take a tip from you and do my offerings together. I’m so pleased you like my challenge, I have not regretted starting it once in the last 6 months. Sometimes we need a bit of motivation, and it is a real driving force for me each week as it forces me to spend time writing. I am absolutely LOVING exploring poetry styles, isn’t if funny how blogs progress! My pleasure, I enjoyed the visit. My reader is so thoroughly crammed that the main time I have to visit people is when they provide me a link in their comments. 🙂 I only started writing poetry again after I started blogging. I thought I would only publish prose when I started. But once a poet, always a poet. I wrote poetry in high school and college, and it just came winging back up out of me. I blog because artists don’t create in a vacuum. I blog because the world has enough ugly. I blog to share suspended moments in time. I blog because it exposes me to a wider world view, to people I would not otherwise meet and interact with. When someone takes the time to comment, to let me know that a particular photo has touched them, emotionally, or lifted their spirit, it tells me someone out there “gets” what I’m trying to convey. And for me, that’s what it’s all about. Thanks for asking!